I finished this book last night. April and Perry gave it to me for Christmas. This book covers the events that were too cumbersome to include in the actual game and the time period is before Deathwing, the dragon, shatters the world. The story itself is compelling, if you are interested at all in the lore surrounding the game. It is a fast read. The chapters aren't very long and what is contained in the chapters moves the story along quickly. But the writing, oh dear, the writing. Perhaps I shouldn't issue complaints, I, who have not published anything, ever. This author has over a dozen books to her credit, including World of Warcraft sanctioned books. Yet, I feel I can weigh in on the writing given that I would love to be a published writer or a working editor or proofreader. Someone should have sent back her manuscript with red marks all over some paragraphs. Don't get me started on the use of Microsoft's "grammar" checker for composition. If you call yourself an editor or proofreader, your stable of tools had better include style books and you better have learned at the feet of a grammarian. I had a problem with the writing seeming to be at a level of 18-25 year-old boys who have never taken a composition class in their lives. There were parts of the novel that could have been completely excised and nothing would have changed. There were sentences that folded in upon themselves as if Ms. Golden had become so lost in the sentence, she'd given up trying to find a way out. Subject + verb. That's a sentence. It's not hard really. The other problem with this is that it was a sanctioned novel. Blizzard asked her to write this book. They provided her with the elements they were removing and those things that were changing. She made up a few things but everything was approved by Blizzard. That doesn't, of itself, make the book bad, it's just that the story was sort of constrained by what was allowed and what wasn't. Fan fiction based on a crafted idea is limiting in and of itself. You really can't bring another love into Han Solo's life and have her fight with Leia for Han's affections, as a for instance. So, when you write about WOW, you are constrained by what the game designers have created. Some people, like the main characters in the novel, have reams of back story. You can't really add to or take away from that story without changing how the designers have created these characters. Yet, around that limitation, you can write a good story and this is where I think the book fails. It's just not well-written, at least how I would define it. There were too many times when I wanted to rewrite a sentence or a paragraph because what she was saying was totally convoluted and lost. I give the book a B. 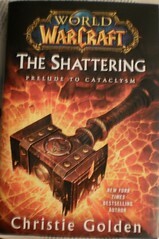 The ONLY reason it's a New York Times Best Seller is because of what it is, the link between what happened during the time Deathwing prepared to blast into this world and the release of the game. There are enough people who want to know that lore who would buy the book and, by sheer numbers, send it to the best seller rack. I have often wished my life had taken me into the realm of writing and words. As I read and grew more dismayed at the lack of real editing in the book, I remembered all the times I tried to break into proofreading, writing and editing. I miss that, that immersion in language. It's hard. Proofreaders are a penny a pound. I could always stand to have my material gone over. I sent out the newsletter for the Great Lakes Chapter of the International Society of Explosives Engineers yesterday. It's something I did for awhile because I volunteered. Then, after a guy who thought he could do it better took it over and failed miserably, my boss volunteered me to do it again. I misspelled a couple of words that one of the guys in the office caught. It was a "there" vs "their" kind of thing. I look at the document for a long time and I read what I know should be there, not what actually is. Maybe that's what happened here. Ms. Golden and her editor worked so closely, they read what they felt was there, not what actually was. What reading this has done, however, is placed in the back of my head the need to finish that story I was working on last year. I edited the first 14 chapters. I wrote the final chapter. I need to get from 14 to the end. I actually don't know how the story gets from 14 to the end which will be fun to write and find out. Now to pick the next book.